SOLD! A fun horse with a lot to give in the right hands. Currently being competed as a show jumper, being regularly placed at British Novice and Discovery level, but would also excel in Dressage and has been showing once and placed 3rd and 4th. It would be nice for him to do some Dressage as well as jumping so that he has some variety in his job, which is what I plan to do until he sells. Has been jumping single fences of up to 1m30 + at home and gives a good feeling with a neat and tidy technique. Willing to stand on the lorry between classes without pawing or calling, good to tack up on the lorry and sensible when riding from the lorry to ring etc. travels well with no banging or fidgeting but prefers lorries to trailers. Has been on beach rides and cross country schooled with previous owner and is said to have been sensible and well behaved. Schools well on the flat with three comfortable, loose paces. Not a novice ride as can be slightly sharp due to being used to a confident, competitive rider but does change to suit the rider. 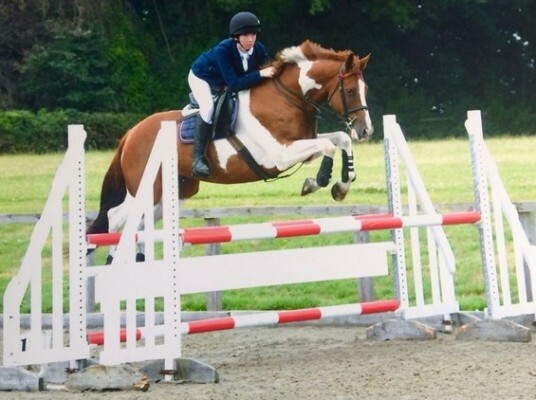 Has been ridden by an 8 year old child on the lead rein and was very safe and sensible. Good to hack out alone and in company. Can be spooky when hacking alone but nothing out of the ordinary. No vices around other horses and just a general pleasure to ride. Very easy to handle on the yard, bringing in and turning out, grooming, tacking up, vet, farrier etc. Generally good with clipping and trimming but a little sensitive around the ears. Whole history known and seems to have been enjoyed and cared for by past owner. 5* home required as only for sale due to me needing a horse to take me further. Comes with rugs if wanted. Saddle available by seperate negotiation.